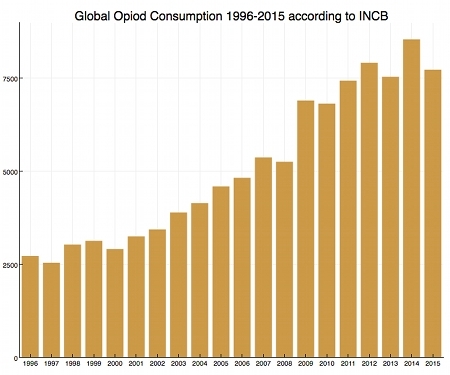 In the Washington Post article “Americans use far more opioids than anyone else in the world” of march 2015 by professor Keith Humphreys a graphical overview over some countries’ opiod uses is given. The data is from the INCB report 2016 (interestingly the Washington Post now keeps its own copy). As far as I understood the INCB (International Narcotics Control Board) covers the legal narcotic drugs. Illicit drugs are referenced in the UNDOC reports. Anyways as you can see in this graphics (or in the table in the report on page 226) Germany ranks third in opiod use, which is -if you know a bit from Germany’s history – not without brisance. I will come back to this later. It is useful to recap a bit about the different types of drugs. According to this graphics (or the INCB report) the top opiod pain killers used in the US were Hydrocodone, Oxycodone and Fentanyl. All have a high danger of addiction. 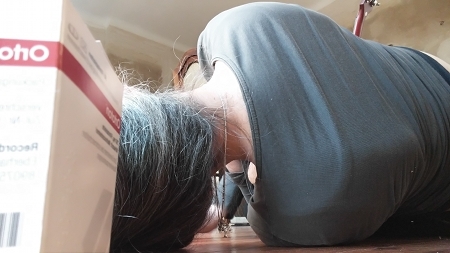 The explosion in prescriptions has subsequently led to an explosion in overdoses and abuse, leading the federal government to dub opioid abuse an epidemic. And apparently too fastly cutting down on pain killers apparently made things worse and let amongst others to heroin addiction. I haven’t heard yet that opiod use was called an epidemic in Germany, although according to the report and the table XIV.1.a. on page 226 Germany uses 30796 vs. 47580 (US) daily doses per million inhabitants per day. That is about two third of the US consumption. The biggest amounts are here though not Hydrocodone like in the US but Fentanyl – the drug which apparently killed the musician Prince. It should also be said that opiods are not the only addictive “medical” drugs but for example in the US Metamphetamine is apparently prescribed for treating obesity and ADHD. Since it is not narcotic it is not mentioned in the INCB report. Methamphetamine, also known as Crystal Meth, had played also a role in World War II under the name Pervitin. Amongst others it was called “Panzerschokolade” (“tank chocolate”) or Stuka-Tablette (“dive bomber pill”). Methamphetamine is a substituted amphetamine, so it belongs to the family of amphetamines for which corresponding pharmaceutical products are e.g. called Adderall, Dyanavel XR, and Evekeo and which are apparently not too uncommon among students. I tried to gather some statistics concerning amphetamine type drugs. The following bar chart is assembled from the World Drug Report 2010 and 2016 (Fig 192 p.208 in WDR 2010, 2000-2008 and Fig. 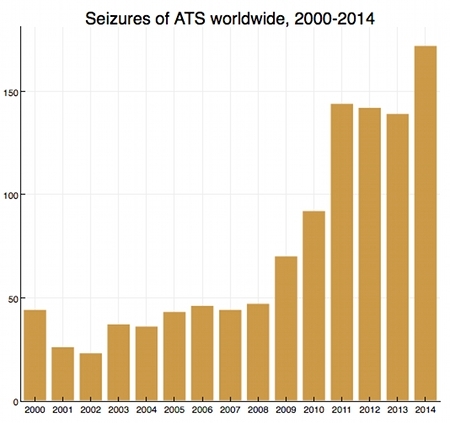 65 p. 53, 2009-2014) which displays the seizures of Amphitamine-Type Stimulants (ATS) worldwide in tons. The diagram has to be taken with a grain of salt, because for 2009-2014 there were no explicit values listed and so I just read the values of the diagram. (Unfortunately the data itself is spread over different world regions in the UNDC tables coming with different units, so it would have been too much work to calculate the numbers from the tables directly. There is a somewhat similar overview in the WDR 2016 page xii intro). Moreover although I wouldn’t call food the “most interesting” reason for the invasion, it is right that food and the economy in general played a role in the rise of Hitler and they played a role in WWII war decisions. I think though it is debatable to what extend the average “farm size” played a major role in those Reich economics problems. Anyways even if Hitlers mental state certainly played a role it is unclear how important this component was. Finally Hitler wasn’t acting alone, in fact he was elected and even his quasi-plenary powers which he gained by the Enabling Act were approved by a rather big share of the members of the parliament. That is if the centre party would have voted against the Enabling Act then he would have missed the two third majority and his rise to power would have been at least more difficult. Although they received five million more votes than in the previous election, the Nazis failed to gain an absolute majority in parliament, and depended on the 8% of seats won by their coalition partner, the German National People’s Party, for a slim majority of 52%. ooo what gloomy discussion here! It is hard to comprehend that the Nazi’s deemed the jews as “unfit” – such a loss of reality is even for megalomanic all brawns remarkable, finally there were distinguished professors and even Nobel laureats fleeing the country which led to an enormous brain drain in Germany. I just say: Albert Einstein, John von Neumann, Robert Oppenheimer etc. But it’s increasingly clear that one country’s allegedly evidence-based Besserwisserei is another country’s intolerable smugness. You probably know about “aranyan physics” or “Deutsche Physik”. The documentation about the officers against Hitler, which was made by Maurice Philipp Remy starts basically on this day on the day of oath. And it displays how some men tried to free themselves from this oath and how in the end they sacrified their lifes, not for Hitler, how they had sworn, but for killing him. It is not only drugs that are a problem in western world but also nutrition. but it seems that a more stringently structured, intelligent food experience is necessary.